The type of HVAC system you choose for your home is an important decision for several reasons. HVAC accounts for an average of 48% of a home’s energy consumption according to the US DOE, so the system’s efficiency must be considered. It produces your indoor climate including temperature and humidity control. Finally, it is a significant financial investment you’ll have to live with for the 15-25 years most HVAC systems last. This guide to HVAC systems is your research into the six major options, their costs, pros and cons and tips for picking the right system for your circumstances. It’s a starting point to exploring the large number of pages on PICKHVAC dedicated to each type of system, to all major brands and far more. We link to important pages throughout this guide. They automatically open in a new tab or window, so you won’t be navigated away from this guide. We list these from most to least common. Pros and cons are included. A summary table and cost table comparing all types are found below. Systems with a central air conditioner and fossil fuel furnace remain very popular. These are also called forced air systems because a blower fan in the furnace circulates air through ducts. It pulls what is called “untreated air” into the system to heat or cool/dehumidify it, then pushes the “treated air” through the ducts and into your living spaces. Most gas furnaces burn natural gas (NG), but propane (LP) is common in rural areas not served by gas lines. The gas valve in any furnace is easily changed to burn LP. Oil furnaces are an option too, but they are used in less than 5% of homes, mostly in the Northeast where home heating oil is more available than gas. They cannot be converted from or into gas furnaces. Some homeowners in Northern climates where summers are mild have just a furnace in their homes – no central AC. Low Equipment Cost: They are slightly lower than heat pump split systems, moderately lower than mini split heat pumps and significantly lower than geothermal heat pumps. Low Operating Cost: Gas furnaces have lower annual energy costs than electric furnaces. High-efficiency furnaces have lower operating costs than boilers. Oil furnaces have the highest heating costs among all fossil fuel furnace types. High Efficiency: Low-efficiency 80% furnaces are a cost-effective choice in warm climates where little heating is required. Furnaces with 90% to almost 97% are a good value in cold climates (and the most efficient furnaces are almost 99% efficient, though not as good a value due to their higher costs). Danger: Gas combustion may produces the risk of explosion and carbon monoxide leaks. Forced Air: A forced air system tends to disperse dust and other allergens around your home, and it might move cooking odors from the kitchen to other parts of the house. When heating, forced air systems dry out the air much more than radiant heat systems. This is a fast-growing sector of the residential HVAC market. They are also called air source heat pumps to distinguish them from geothermal heat pumps that gather heat underground either from soil or water. Heat pumps provide heating and air conditioning. They don’t create heat by burning fossil fuel. Instead, they circulate refrigerant using a compressor. The amount of fossil fuel burned at the power plant to create the needed electricity to run a heat pump is up to 60% less than gas and oil furnaces burn. If your energy provider generates a portion of its power with wind or solar, then the carbon footprint of a heat pump is even smaller. The refrigerant picks up heat indoors when cooling and dumps it outdoors; when heating, the process is reversed. There’s a lot more information in our Heat Pump Buying Guide. The indoor unit is usually an air handler with a blower to circulate air through the system for heating and cooling before pushing it into the living spaces of your home. Low Equipment costs: They are less expensive than mini split systems and much less expensive than geothermal heat pumps. Low Operating Cost: Air source heat pumps have lower annual energy costs than electric furnaces, gas furnaces and boiler systems. Low Efficiency for Heating in Cold Climate: Most heat pumps cannot heat effectively in subfreezing temperatures. They rely on electric resistance heat strips (like space heaters) in the air handler to supply makeup heat. Resistance heat is very expensive. Forced air: Spreads dust and odors. Dries the air. The pros and cons are generally the same as those mentioned above for furnaces and heat pumps. An additional pro is more effective heating in cold climates. Another con is that dual fuel systems cost more than either an AC & furnace or heat pump. Sales of mini split heat pump systems have grown by double digits for quite a few years in a row. Their popularity is spurred by more competitive costs, increasing efficiency and the fact that many split system heat pumps provide effective heating in sub-freezing temperatures. Single-zone systems have one outdoor and one indoor unit is size from about 9K to 42K BTUs (9MBH to 42MBH). Multizone systems have an outdoor unit ranging from about 18K to 60K BTUs to serve up to 8 indoor units. Heat pump operate similarly to standard heat pumps, though most use inverter technology. This means that they run most of the time when heating or cooling, but at very low capacities, ramping up or down as needed to maintain even indoor temperatures. These systems are commonly called ductless because they don’t require ducts. However, ducted mini split systems are available too. The indoor units are installed inside existing duct near the living space. The advantage of them is that the indoor units are hidden. As with most other HVAC system types, we’ve completed a comprehensive Guide to Mini Split Systems. Low Operating cost: Lower annual energy costs than electric furnaces, gas furnaces, boiler systems and many standard split system heat pumps. High Efficiency: This is your most energy-efficient option besides highly efficient geothermal heat pumps. Good Value: The amazing efficiencies (up to 38 SEER) of today’s most efficient mini split heat pumps makes them a cost-effective alternative to costlier geothermal systems. Zoned systems: All systems are zoned systems. High Cost: Many mini split heat pump systems cost more than a traditional split heat pump system. Heating effectiveness: If you experience subfreezing winter temperatures, you’ll need a cold-climate mini split system. Most do not qualify, and those that do are expensive. Repairs: Parts can be harder to get than parts for standard systems. Costs could be higher. While more common in Europe than here, boiler systems are available. Many homeowner appreciate their advantages, though cost is higher. Gas, oil and electric boilers are available, but the operating costs of electric units make them a poor choice unless very little heating is needed. Most modern boilers create very hot water, though a few steam boilers are still produced. The boiler circulates the water or steam through pipes leading to radiators or through tubes installed in the subfloor that radiate heat up through the floor. See our Boiler Buying Guide for full details and links to buying guides for today’s top boiler brands. Is a boiler a good choice for your home? If you’re replacing an old boiler, it is more cost-effective to install a new boiler than a forced air system, since you’ll need to install ductwork and vents too. There worth considering for new construction and for additions that will get a separate heating system. The Most Comfort: Radiant heat is the most comfortable heating solution in the world. Warm floors are also very nice in winter. Babies and Dogs love them too! Domestic Hot Water: That’s the term for the water used for laundry, showers, etc. Combination boilers are popular because they provide water for heating and domestic hot water. They’re called combi boilers. High Cost: Boilers are more expensive than furnaces and many standard and mini split heat pumps. 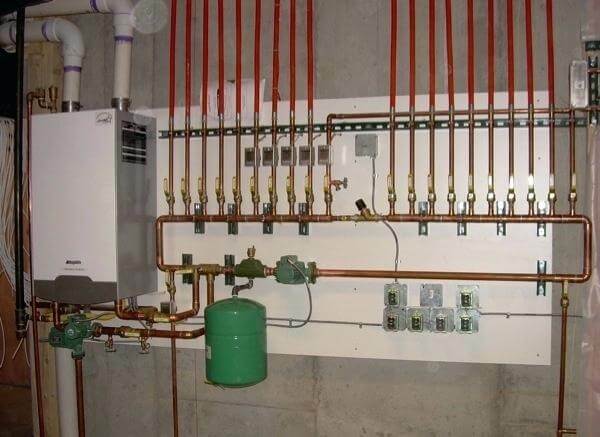 The installation of radiant floor pipes is very expensive. Radiator or Radiant Floor Pipes: Required. Slow Heating: Boiler systems take up to an hour to heat up when cold and start generating heat in the house. Also, if you want a boost in heat, you won’t feel it as fast as you would with other heating options. Geothermal systems circulate water in pipes below ground where it is warmed in winter and cooled in summer. When heating, refrigerant concentrates solar heat stored in the earth for heating. It’s easier to gather heat in soil or water that is 50-60 degrees Fahrenheit than it is to capture heat in near-freezing or subfreezing air. Geothermal heat pumps also cool efficiently because it is easier to dump heat in the cool temperatures below ground than in very warm summer air. These factors make geothermal heat pump systems efficient and a favorite among homeowners committed to using renewable energy. Our Geothermal Buying Guide is loaded with information, costs and top brands. But here are the most important geothermal HVAC pros and cons. Efficiency and Operating Cost: These systems are most efficient, so have the lowest annual energy of any on this page. Long-term Value: The higher equipment cost will be paid for in energy savings over the life of the system. Cost: The tradeoff for efficient, cheap heating and cooling is the cost of the systems, the most expensive on this page. Repairs: These tend to be costlier to repair, especially if the ground loop system requires repairing. Electric furnaces are affordable, and they don’t need to be vented like gas furnaces. However, they use more energy than any other heat source in this guide. That sums up their pros and cons, but there is much more information in our Electric Furnace Buying Guide. Electric furnaces are best used in warm climates where heat is needed only occasionally and in part-time homes. They are large space heaters with a fan, and they blow heat through ductwork. Many are installed in a split system with a central air conditioner. System Cost includes the cost of a system for an average 2,000 square foot home in a moderate climate. Operating Costs is an average if the unit is the main source of heating and/or air conditioning. The efficiency of the unit significantly affects operating cost. This table shows at a glance the key features of each HVAC type including average installed cost – the cost of the equipment, all installation supplies and materials and the labor to install it. Costs do not include ductwork for ducted systems or the hydronic pipes and/or radiators for boiler systems. Replacement: If your current system uses ductwork, your upfront costs will be lowest if the new system also uses ductwork – Standard split system, geothermal or electric furnace (warm climates only). Replacing a boiler/radiant system or a mini split ductless system with the same type also presents the lowest equipment and installation costs. Adding new infrastructure such as ductwork, a radiant system or through-the-wall refrigerant lines is much costlier than a direct replacement of what is currently there. New construction: If you are building a new home or an addition, then you’ve got a clean HVAC slate to work with. Climate: How hot summers are and how cold winters are makes a difference in the best HVAC system for your home. Warm/Hot climates: Your heat pump options are efficient and dehumidify when in AC mode. The longer you plan to stay in your home, the more it makes economic sense to install geothermal. For ten years or less, we recommend a standard split system or mini split heat pump. A central air conditioner and 80% efficient gas furnace will save you a few dollars on equipment but will produce slightly higher heating costs. The furnace/AC combination is attractive if you only need the furnace for a few cold spells during winter. An electric furnace should be considered only if you heat very minimally, perhaps less than 15 days per year. Moderate climates: An AC and gas furnace combination remains the most popular option. We recommend that you get estimates for both an AC/gas furnace split system and a standard heat pump/air handler split system. Compare equipment costs vs. annual operating cost to see how many years of lower utility bills it will take to pay back the higher cost of the heat pump. That will assist you in deciding which is right for you. Geothermal is a good option here too, but the time it takes to recoup the higher cost is longer than in extreme climates. Cold climates: Our opinion is that the traditional gas furnace with or without a central air conditioner is the most cost-effective system type. We are very impressed with the new cold-climate air source heat pumps, both standard and mini split, so our opinion on this might change if costs come down on those units, as they have on geothermal systems. If you’d prefer a heat pump to a gas furnace, consider a dual fuel system that will heat with the heat pump in all but the coldest weather. How long you’ll live there: Efficient equipment is more expensive. That’s the obvious trade-off. In extreme climates, the payback period for very efficient equipment is shorter, so you’ll cover the extra costs of the equipment pretty quickly and enjoy lower annual operating costs for the life of the system. By the way, electric furnaces are NOT an attractive selling point to energy-conscious homebuyers. How green you want to be: When reducing carbon emissions is paramount, then choosing the most efficient HVAC system within your budget is the right decision. The ultimate is a high-efficiency geothermal system, perhaps powered with a solar power system. House size: If considering heat pumps, a standard split system is cost-effective for medium-to-large homes. A mini split is our choice for single-zone settings like very small homes, additions, garage conversions and similar. When you begin installing multiple indoor units, costs rise quickly.